﻿﻿﻿Bumblebee-attracting eryngo brightens late-summer fields. ﻿﻿﻿﻿﻿﻿﻿﻿In late summer, when spring wildflowers have gone to seed and grasses fade to colors of rust and dust, eryngo brightens fields and meadows with deep-purple flower heads. Borne on branching stalks up to 3 feet high, the blooms look like miniature pineapples with rings of spiky, leaf-like bracts at the top and bottom. In full flower, this annual plant is hard to miss. I’ve admired eryngo since my high school days. In that sad season when I had to put away my flip-flops and go back to class, those tough-but-lovely flowers came along to cheer me up. Back then, not knowing the plant’s true name, I called it “Nancy’s thistle” in honor of a feisty friend whose favorite color was purple. In fact, Eryngium leavenworthii is not a thistle. True thistles are in the aster family, along with daisies and sunflowers. Eryngo, by contrast, belongs to the carrot family. It’s related to celery, parsnips and several plants from the herb garden including fennel, parsley, coriander, caraway and dill. It’s also a distant cousin of the annoying hedgeparsley (called “beggar’s lice” or “tickseed” in some parts of Texas), whose fuzzy gray fruits cling to socks and shoelaces. Many well-known plants in the parsley family came to North America from other countries, but eryngo is native. It grows wild on plains and prairies, brandishing its purple “pineapples” across central and north-central Texas and into the Midwestern states. The Latin name honors Melines Conklin Leavenworth, a U.S. Army surgeon and field botanist who collected and described this species in the 1800s. In a field with other vegetation, eryngo isn’t especially noticeable until it blooms. Seedlings emerge in spring, forming taproots and strong hollow stems by mid-July. The leaves are spiky like the flower bracts, with three to five sharp-pointed lobes and bases that clasp the stem. Developing flower heads are silver-green like the foliage. When they change color in late August or September, the whole plant turns purple. Viewed up close, the flower head is a cluster of tiny flowers arranged in diagonal rows. Individual flowers are guarded by small bracts, miniature versions of the conspicuous spikes at both ends of the cluster. Each flower has five petals and five pollen-bearing stamens with bright blue anthers, opening first in the lower ranks and progressing upward. 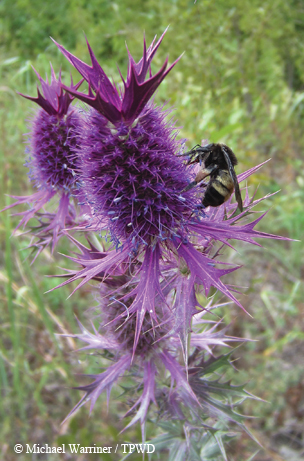 Deer seldom molest this prickly plant, but insects love the purple blooms. Eryngo is an important food source for native bumblebees. It flowers just as new queens prepare for winter hibernation, storing energy that will keep them alive and able to found new colonies in the spring. Eryngo blossoms are good for flower arrangements. Picked in full bloom, they’ll keep their shape and color for some time. Hung upside-down and dried, they’ll last even longer. Plants left in the ground to complete their life cycle will turn brown as seeds mature, usually four to six weeks after the stamens emerge. Seeds are long and narrow and quite small, measuring about 2 millimeters from tip to tip. Some are eaten by songbirds, but they usually drop a few in the process. Some fall naturally from the drying heads or get scattered when a field is mowed. Where eryngo blooms this fall, it’s likely that some of its offspring will be around to brighten the prairie next year.